A book I wrote, Bill the Boy Wonder: The Secret Co-Creator of Batman (illustrated by Ty Templeton), should have been nominated for a 2013 Eisner Award. It is unprecedented in topic. It is unprecedented in approach. It is unprecedented in research. It received mainstream critical acclaim, including an invitation to give a TED talk. It has already had a positive real-world impact on the family. Kids, I’m happy to report, love it. But perhaps it is because the book is eligible for both that it was nominated for neither. Unfortunately, some have a perception that nonfiction for young readers or for all ages is not as “legitimate” as exclusively adult nonfiction. However, I am hardly the only one who strongly disagrees with this view. And I feel it makes an even stronger statement to tell this story a format that is, to some, so unexpected. For nearly 75 years, the sole creator myth that cartoonist Bob Kane started has reigned, and no previous book has gone far enough to debunk this. 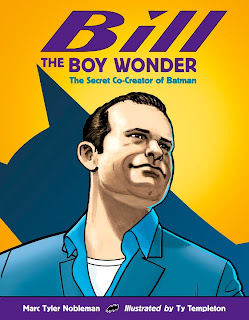 No previous book has put Bill Finger, uncredited co-creator and original writer of Batman (quite possibly the most popular—and almost certainly the most lucrative—superhero in world history) at the rightful center of the story. That alone makes this a book worthy of some distinction. Bill the Boy Wonder, the result of five years (and counting) of intensive sleuthing, is the first book on Bill. Strange that it took this long; his peers and fans alike considered him everything from the most gifted comics writer of his generation to an unequivocal genius. I was one of the last writers (if not the last writer) in touch with several of Bill’s Golden and Silver Age colleagues (Arnold Drake, Alvin Schwartz, Carmine Infantino) before they died, and none of Bill’s family and non-comics friends I contacted had ever been interviewed about him. I uncovered everything from his high school yearbook photo to the only known note in his handwriting to his WWII draft record to his death certificate (first two in the book, second two on this blog). None of it was a mere Google away. For all of above, my book is the only print source. Plus I continue to find even more info and I regularly share it on this blog and at speaking engagements, free of charge. That’s the modern model of storytelling. Despite what the comics community believed for decades, I discovered that Bill does have the aforementioned heir, a granddaughter born two years after he died. She is in the unique position to try to correct the ubiquitous, contractually mandated, yet egregiously inaccurate credit line “Batman created by Bob Kane.” In the history of comics, whole credit lines have been added to superheroes after years of anonymity, but no existing superhero credit line has changed. I know that a real-world repercussion is not a criterion for an Eisner nomination, and even if that never happens, the book is still a landmark work in the field. Again a bold statement, but I can’t very well continue to call Bill’s failure to speak up on his own behalf a fatal flaw and then follow his lead. Disclaimer: This opinion is no way a judgment on any of the deserving talents who were nominated; I am not comparing my work to theirs but rather assessing it on its own. Good luck to all of the nominees. I've heard of getting screwed out a deserving honor, or even snubbed, but this takes the cake. That's really nice of you, hobbyfan, thanks. It's a shame the book was ignored by the Eisner Awards. It is a ground breaking publication with reverberations that continue to ripple throughout the comic book world.